The Awarua Tracking Station, photographed March 2008 by Robin McNiell. In 2007 the European Space Agency and the NZ Government signed an agreement to setup and operate a tracking station for their ATV launches. ESA PR 17-2007. 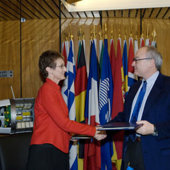 Today ESA Director General Jean-Jacques Dordain and Her Excellency Ms Sarah Dennis, New Zealand's Ambassador to France, signed an arrangement on the installation of a transportable telemetry station to track the Ariane 5 launcher that will carry into orbit ESA’s Automated Transfer Vehicle (ATV) for its maiden flight in autumn this year.